The D is silent. Payback won't be. Tarantino's latest bloodfest has garned popular and critical approval (not forgetting the awards nominations). 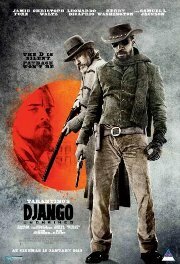 Set two years before the US Civil war, it is the tale of a rescued slave who joins a white bounty hunter to learn the trade. His real mission is to rescue his enslaved wife from a notorious plantation, and once the preliminary captures and kills are out of the way, the bounty hunters head for their showdown at Candyland. Comments The film has been classified 16 LVP after discussion, unanimous decision. The classification committee's decision is based on the complex and mature themes as well as the moderate to strong classifiable elements which are contexually justified.